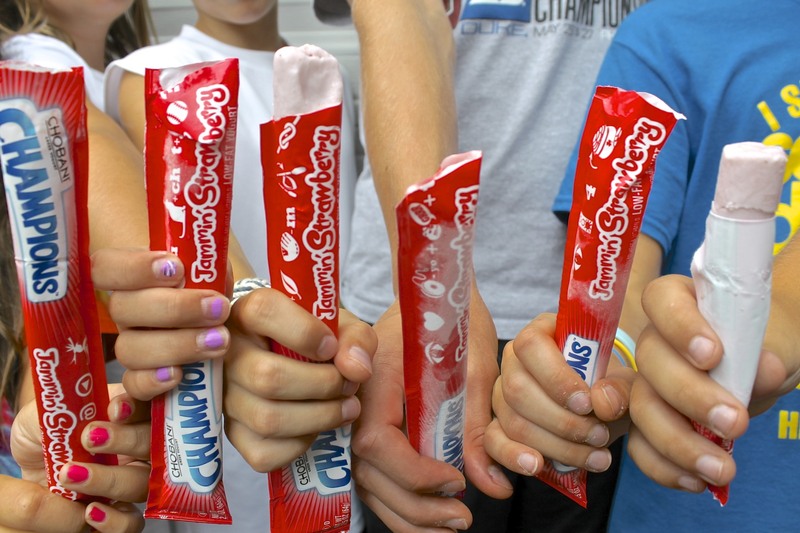 A Frozen Yogurt Treat and a Chobani Give-Away–WINNER ANNOUNCED! AND THE WINNER IS…. AMANDA N.! Amanda, please email me through the contact page on this site with your complete name and address. I will forward this information to Chobani, and you will receive your package soon. Congratulations and thanks to everyone who entered. If you would like to see more of this type of giveaway, please let me know! Like many of you, my family is a big fan of Greek yogurt. I eat a cup of Chobani Greek yogurt with my lunch almost every day. Although my top picks used to be strawberry and peach, I now opt for plain and dip slices of apple or other fruit in it. The sweet-tart combination is divine! My husband and younger son each have their favorite flavors. My older son never liked any yogurt until I doctored up the plain yogurt with a drizzle of maple syrup and a sprinkle of granola. Now it is his favorite post-sports snack. All the protein makes it a perfect recovery food and he loves the taste. Beyond eating the yogurt plain, I use it in a lot of cooking and baking. From this popular recipe for Parmesan Crusted Salmon to these Blueberry Peach Muffins–which boast two full cups of Chobani!–it’s uses are many. If you look through the recipes on this site, you will find a myriad of recipes across the various categories. When used in the proper ratios, Greek yogurt may be used as an effective substitute for mayonnaise, sour cream, oil, etc., in cooking and baking and can be done in a way that maximizes flavor and nutrition. When the kids were young, I used to freeze yogurt tubes for a healthy popsicle. I stopped offering that snack when I realized the brand of yogurt I was freezing was more sugar and artificial ingredients than calcium and protein. When I noticed a better ingredient list on Chobani’s all-natural version recently, I popped a box in the freezer for a quick treat on a hot day. They were a hit with my 15 and 11-year-old, as well as with the four neighborhood friends who were over the first time I offered them. AND THEN, Chobani very kindly offered to provide a case of their 6-ounce Greek yogurt cups (12 in all) to a Fountain Avenue Kitchen reader! So, if you are a Chobani fan–or if you aren’t but would like to give it a try–all you have to do it comment below. This giveaway will end on Thursday, August 29, 2013 at noon Eastern Daylight time. (Due to the nature of the product, Chobani is only able to ship to U.S. residents.) I will announce a winner by 6:00 that evening. The winner must contact me within 24 hours with a complete name and mailing address. If there is no response, another winner will be chosen. Good luck…and while you are commenting, feel free to share your favorite ways to bake or cook with Greek yogurt, or simply how you like to enjoy it straight from the 6-ounce cup or quart container! The prize box will contain twelve 6-ounce cups of assorted Chobani flavors. Thanks so much for this contest! Love your yogurt! love Chobani Greek Yogurt…it’s the best! I love choboni greek yogurt! My favorite treat! Hope I am the lucky winner! Love the creamy thick texture. Great flavors too. I love to mix 1/2 a Vanilla and 1/2 plain and sprinkle fresh raspberries or homemade granola on top Yum! I also used the plain Chobani in the sauce for my very first homemade tuna casserole this week the whole family loved it! Love Greek yogurt. Did some research and Chabani has more protein than Dannon. The best yogurt on Earth!!! Love your posts! Love yogurt! Oh, how I LOVE Chobani!! I’m completely hooked on the pineapple! I am sooo addicted to this stuff. need my next fix! Love Chobani! And Fountain Avenue Kitchen! We love chobani! Would love to win this for sure. Good luck to everyone participating! I would love to try your Greek Yoghurt. I use Greek yoghurt all the time for my cucumber and tomato salad, and use it for any recipe that calls for sour cream or cream cheese. You just entered by leaving a comment, Myra. Good luck! The banana yogurt is the favorite in our house! Love Love Love Chobani!!!! Simply the best! I love, love, love Chobani Greek Yogurt! We love Chobani and use it in our Overnight No-Cook Oatmeal Yogurt Cups. My husband is not a yogurt fan and loves the Chobani in this recipe. Yummy Yummy Yogurt! Strawberry is my favorite but I am really digging blueberry lately as well. I love Greek yogurt…the best! I love Chobani yogurt!!! I just bought Tropical Escape and I can’t wait to try it. Love me lots of Chobani!! Best Greek Yogurt I ever tasted. Buy it by the quart. Chobani is the best Greek Yogurt ever, I buy it by the quart. I’ve never had your yogurt, I keep saying I’m going to try it just haven’t yet. But all of my Co workers eat your yogurts everyday. We use a generous dollop of Chobani as a smoothie base. It is a great way to add protein and calcium to on-the-go breakfasts. can’t find a better yogurt to indulge in… Hope i win the box of plenty!! Love their plain or vanilla with a sprinkle of brown sugar! My favorite! Still haven’t tried the flips yet! Haven’t tried a flavor of Chobani I don’t love! Yum! Love Chobani – Especially the Pineapple and the Mango – YUM!!! I <3 fountain avenue kitchen and Chobani! Chobani is a favorite in our house too! Absolutely LOVE Chobani! Vanilla is the best. I love Greek yogurt and Chobani is the BEST! Thank you Fountain Avenue Kitchen! We love Chobani. I’m not a yogurt fan (texture), but I enjoy a good cup of chobani. I love Chobani and have it for breakfast daily. I also eat the mint/chocolate chip before bed every night. Yummmmmmmmmm! yummmm! this would be great fir the kids and I, we might even share with dad. IF I have not eaten all of the Chobani yogurt in the fridge, I use it for baking a lot. It makes the best coconut cream pie ever! I finally found a yogurt my husband will eat! He says it is his favorite! Mine too! Chobani is my go to yogurt! Our whole family loves chobani yogurt! Yum! I love Greek yogurt, my favorite way to enjoy it is fresh but I do love baking with it as well! New to chobani, tried it a few weeks ago and I thought it was great. Will be having more real soon! Keep up the good work! The whole family loves and eats Chobani yogurt on a daily basis. Love it !!!!! I love their yogurt — and my picky 6 year old does too! My husband and I are both fans! I *love* yogurt! It’s great to tart-up baking recipes or as a dip for veggies. I am looking for a healthy snack option Chobani might just be the one I try. I haven’t tried Chobani yogurt yet this might be the time to try it. I’ve never tried it, but would like to. Looks so yummie, little girl approved too! yummy…want to try all the flavors!!!! I substitute greek yogurt in so many recipes! No one can tell and it tastes great! I also always have to have a stock for eating in my fridge! I would live to try Chobani in recipes! I use Chobani greek yogurt in absolutley everything I can. I have lots of food allergies and really struggle to get enough protein and greek yogurt has helped me a ton! Would love to try more flavors of this yummy greek yogurt. Mmm hmmm, I want it! I love that its so tasty & goes great in recipes! I tried Chobani yogurt for the first time last fall, and now I am hooked! I’ve also recently flipped for the Chobani Flips! We always have at least one kind in the fridge. Pineapple has always been my favorite, but I just tried Blackberry and loved it! My only choice for a snack. We eat Chobani all the time.i buy 20 cartons a week, my son eats 2 or 3 a day,it is so good! LOVE, LOVE, LOVE Greek yogurt! I have made homemade yogurt since college in the ’70’s, but the protein and taste of the Greek and its usefulnesss is to die for. I buy 2 quarts of plain, non-fat Greek yogurt a week and use the full- or low-fat in salads as it holds up better. I also love your website and recipes. Chobani is my favourite brand of Greek yogurt. Handy to-go bowls, that can be re-used for many purposes, and such delicious yogurt! I enjoy the toppings, and the creamy texture of the yogurt. Best product ever! We love Chobani….though I admit I’ve done next to no cooking with it, just added it to potato salad. WHAT A WONDERFUL GIVEAWAY…THANX FOR THE CHANCE!!! i have a chobani every morning, i love the vanilla flavor! I love Chobani! I like to put cocoa powder in it. Great giveaway. There are so many healthier versions to recipes by using Chobani. The different flavors are nummy. What a cool thing. Thanks for the offering to win and good cooking/good eats. 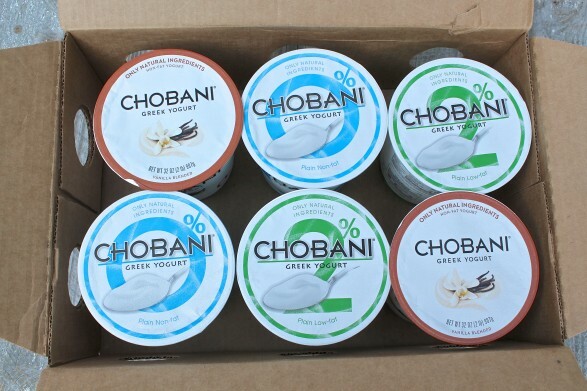 I love Chobani – it’s the best Greek yogurt. Love this yogurt! The pineapple is a terrific base for the “green” smoothies I make each morning. The tang is perfect and I love all the protein. I need to get some key lime for a delicious looking cake recipe I found today!! Can’t wait to try it!! Yummy Chobani makes everything better!!!!!! LOVE Chobani! Thanks for the chance. I use Chobani in my smoothies every morning. Mixing their flavors with fresh, summer fruit is a great way to start the day! There is always a container or two of Chobani yogurt in my refrigerator. I enjoy the vanilla with my homemade granola. I use the plain in cooking and in place of sour cream on my huevos rancheros. My dog get a dollup of plain each day, also, sometimes with a few blueberries added. I love Greek Yogurt. Just this week I made pancakes with Chobani Blueberry Greek Yogurt. They were amazingly delicious. We learn love Chobani! We use it to replace sour cream in recipes and dips, as well as eat it straight up, and frozen as ice cream! Really helps when trying to achieve a real food lifestyle! My husband takes Chobani yogurt to work every day for his snack! We would love to win this special treat! We never win, but it would be nice!